Encodes for four to six proteins. Some hantaviruses also encode a NSs protein on their S segment. The viral RNA dependent RNA polymerase (L) binds to a promoter on each encapsidated segment, and transcribes the mRNA. These are capped by L protein during synthesis using cap snatching . Transcription is terminated by a strong hairpin sequence at the end of each gene. mRNAs are capped by L protein during synthesis. 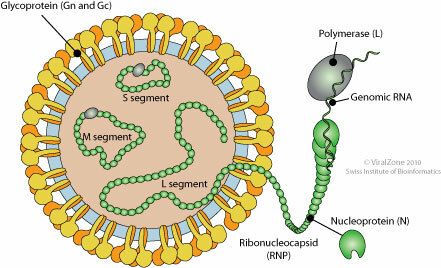 Puumala virus expressed an additional NSs by leaky scanning in the NS gene.